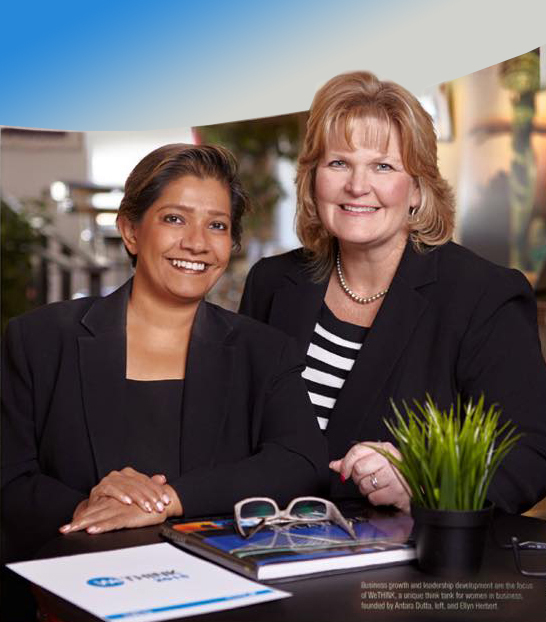 Antara Dutta (Delaware SCORE Past President) and Ellyn Herbert (SBA, Economic Development Specialist) were recently featured as the lead article in the Delaware Business Times for their innovative program, "WeThink", helping woman entrepreneurs in the Delaware business community achieve their full potential. The next step in this program is to develop a regional or national adoption of the model to reach under-served small business communities. There’s an “a-ha” moment of clarity when an ineffective business model gives way to a new perspective. That’s the moment Ellyn Herbert and Antara Dutta say they love best about their custom business mentoring program designed to give stalled, women-owned businesses a reboot. WeTHINK is a program piloted by SBA and SCORE and the brainchild of Herbert and Dutta, who were convinced they should merge their backgrounds in the corporate and entrepreneurial sectors to create a boot camp for retooling small businesses. The program, which includes just 10 participants, is now in its second year and has a waiting list. “The primary void we fill is that we take the education component and the counseling component and we provide context and continuity,” said Dutta. An innovative think tank that combines roundtable discussions as part of a collaborative learning environment, the yearlong program is punctuated by individual assessments for each participant by Herbert and Dutta. The results are measurable, sometimes significant changes in marketing strategy, branding messages, and for one business owner, the birth of a second company. Group meetings feature business development modules on brand, marketing, sales, operations, cash flow management, capitalization, and growth, according to Herbert. But key to the program’s success is one-on-one sessions with Dutta and Herbert, who participants praise for offering comprehensive and concise critique as they vet each member’s financials and analyze possible sticking points of their business. But that “a-ha” moment makes it worthwhile, a critical pivot of the business mindset that can make the difference between uncomfortable business inertia and a new plan for growth. It’s less about outside influences and more about tapping into the power to make a change. If there’s a reason for the WeTHINK’s success, it’s in Herbert and Dutta’s disparate business background. Herbert is an economic development specialist with the SBA, while Dutta, a first-generation immigrant, has broken barriers as the first person of color and first female president at SCORE. She also works an independent management consultant, founder and owner of an integrated wellness program and a SCORE volunteer. Already active in one-on-one mentoring with small businesses, they noted that while women-owned businesses were starting at a record pace, their revenues and job creations remained flat, a factor that was borne out in a 2012 American Express study of women-owned businesses. They identified four potential factors why these businesses fail to thrive, including limitations in traditional training; areas where women face unique challenges in growing, delivering and making a mark professionally; and skills-based deficiencies and the potential for gender and racial bias. But they knew they wanted to bring their expertise to a group of women without losing the custom impact of one-on-one counseling sessions, said Herbert. Most significantly, they wanted facilitate opportunities for women to apply new skills or recognize gaps in their business strategy. Kelly Jones, owner of the The Cleaning Girl, had already sold off one thriving cleaning business because she felt like she was drowning in the demands of the behind-the-scenes workload. When she decided revive it several years later, she knew she needed a different model. She went back to school, and emerged with new marketing ideas and a reputation for great work. She was able to grab a spot in the WeTHINK program and said Herbert and Dutta have helped refine her business plan and address the fundamentals like human resource policies, email campaigns, and identifying her target audience. They also suggested she tweak her message, a concept where she felt lacking in confidence and expertise. Kristin Ball Motley was a pharmacist by trade. In 2010, she launched HCS of the Delaware Valley, a corporate health and wellness company that offers everything from smoking cessation programs to helping employees of self-insured employers gain access to free meds through the Pharmaceutical Industry Program. But while she was trained in drugs and diseases, she found struggled with the marketing and sales side of her venture. Quickly, Dutta and Herbert assessed Motley’s business protocols and zeroed in on her problem — no sales strategy. With her business based in Wilmington, Motley said she’s working closely with the team to develop the strategy, looking to Dutta and Herbert for guidance but leaning into her fellow participants for feedback. Lisa Bryant was working as an independent financial literacy and leadership advisor to nonprofits and small businesses. But her passion was rooted in campus-based Greek letter organizations. Dutta and Herbert suggested Bryant pivot from her main offerings to focus on similar work with Greek organizations, mainly colleges and universities. Michele Reynolds said she still keeps in touch with women she met in the inaugural 2013 WeTHINK class, and returns to the monthly meetings to mix with this year’s participants. “I love to be able to help other women, we all have so much to offer each other,” said Reynolds, owner of Blue Hen Utility Services Inc., the only independent utility company in Delaware. Reynolds was the longtime owner of a local electrical contracting business, wrestling with the financial implications of the recession when she joined We THINK. “It was a lot like a bootcamp,” said Reynolds, who said the process is valuable to business owners bent on strategic growth — and willing to take a hard look at their standing through the combined Herbert and Dutta business lens. For Reynolds, it meant thinking through her options to gain financial footing, and listening to Dutta and Reynolds when they showed her how to think more strategically. “They what say, ‘This is where you are, now what steps are you going to take to get out of it,’” said Reynolds. Ironically, the answer lay in opening a second company. But the business was ripe for a change, according to Herbert and Reynolds. She had long contracted out high-voltage work to regional utility services. She decided to start her own and launched Blue Hen Utility Services Inc. last year, tapping into the expertise of Dutta and Herbert who helped her finesse her business plan. Blue Hen has taken on roughly 35 private sector projects this year and Reynolds said her lighting contracting business has also improved. Herbert and Dutta estimate they spend between 13 and 15 hours each month on the program and have been tapped nationally by SCORE and others about the possibility of expanding the program and rolling it out on a national stage. But Herbert said the possibilities are much broader in scope.